New bows may be rosined when you receive them due to the fact I frequently hand-select bows by playing them. If you do not want a rosined bow, please let me know. Weight: 81.3g, Balance: 9 3/8"
Arcos Brasil gold-mounted cello bows are a quality, handcrafted Pernambuco bow at an affordable price. Selected premium pernambuco, gold mounted cello bow. Selected premium pernambuco, gold mounted cello bow. Weight: 80.7g, Balance: 9 1/4"
A special replica of the original master's design. Weight: 81.6g, Balance: 9 3/8"
Completely Hand-crafted ultra-premium pernambuco Cello bow. Weight: 81.5 g, Balance: 9 1/4"
Hand crafted by master bow maker Manoel Francisco. Silver Special. Hand made stick and frog. Pernambuco. Made using hollow carbon weave construction. Super light and strong. Perfect for electric cellos or modern playing, including chopping or heavy metal. Weight: 79g, Balance: 9 1/2"
Weight: 81.5 g, Balance: 9.4"
Silver Special. Hand made stick and frog. Designed by the leaders of advanced bowmaking, the GS delivers exquisite handling and expressive sound once reserved only for the finest master bows. Weight: 80.5g Balance: 9 1/2"
Selected premium pernambuco, sterling silver mounted cello bow. 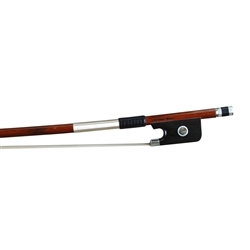 Weight: 82 g, Balance: 9 1/4"
Arcos Brasil Sterling silver mounted Cello bows are a quality, handcrafted pernambuco bow at an affordable price. Selected premium pernambuco, sterling silver mounted cello bow. Weight: 81.1g, Balance: 9 3/8"
Professional quality carbon outperforms all other carbon bows and most wood bows. Super light, strong, fast with a brilliant sound for soloists. Fleur de Lis Snakewood Horn Frog! Weight: 81 g, Balance: 9.25"
Weight: 81.6, Balance: 9 1/8"
Weight: 80.6, Balance: 9 9/16"
Weight: 81.7g, Balance: 9 5/8"
Weight: 81.6g, Balance: 9 1/4"
Weight: 81g, Balance: 9 1/4"
Weight: 81.2g, Balance: 9 1/2"
Weight: 81.2g, Balance: 9 5/8"
Weight: 80.8g, Balance: 9 1/4"
Weight: 82 gm Balance: 9 1/2"
This is the actual bow you will receive. Weight: 81 gm Balance: 9 3/8"
Weight: 81 gm Balance: 8 7/8"
Weight: 81.4 gm Balance: 9 1/8"
Weight: 81.2 gm Balance: 9"
Weight: 80.7 gm Balance: 9 5/8"
Weight: 81.9g, Balance: 9 3/4"
Carbon Graphite diamond weave with an acoustic kevlar core! The GX offers performance once reserved for only the finest pernambuco bow. Hand-made pernambuco with nickel fittings. Weight 78.4g, Balance: 9 5/8"
Lighter weight cello bow averaging 78 grams (2+ grams lighter than typical). It is an ideal bow for players seeking both light maneuverability and rich tonality. The SX offers performance once reserved for only the finest pernambuco bow. Sterling silver wound designed for the advanced student, however this bow seems to be the professionals preferred choice over the GX. The Cadenza Master bow Carbon core with a pernambuco exterior. 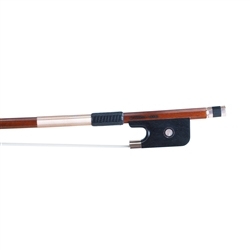 This bow provides professional musicians with a top quality bow with all the outstanding playing and tonal characteristics of fine pernambuco. The beautiful silver-mounted and inlaid frog and buttons, and French-style grip please the most discerning eye. Carbon Graphite diamond weave with an acoustic kevlar core! The NX offers the student high performance at an affordable price. Carbon core with a pernambuco exterior. This bow provides serious musicians a top quality bow with all the outstanding playing and tonal characteristics of fine pernambuco. The beautiful nickel silver-mounted and inlaid frog and buttons, and French-style grip please the most discerning eye. Select wood bow with nickel mounted ebony frog, mother-of-pearl slide, and Mongolian horsehair. Handcrafted with attention to detail. Snakewood baroque-style cellos bows in two grades. JET carbon fiber bow - This bow provides strength and performance far beyond any wood bow in this price range. Woven carbon fiber, Strong yet nimble and produces a great sound!